With the extreme wintry weather causing misery across the country these holidays, let’s look at how power outages impact on your home security system. The recent storm damage that has devastated electricity supplies has affected thousands of families across the US and Canada. Some areas experienced no power for days. Often thieves and criminals see a power outage as the perfect time to strike. Battery’s flat and the neighborhood’s in darkness and normal activity is disrupted. Homes may be empty with the occupants opting to stay with friends or family until power is restored. Most of us are aware that many security systems, including cellular home security systems, provide battery back-up. What you need to know is; will these options allow your system to work during a power outage and for how long? If you live in an area of the country that is vulnerable to extreme weather conditions and the ensuing power outages, you may want to consider the following. It’s likely that your home security system has a battery backup but what you need to know are the limits of its abilities. How long can this backup facility work before it can no longer protect your home? To answer the question accurately there are plenty of variables to consider; the battery’s age, how hot does it get, how much power is being used by the system. Other things also affect the battery during power outages. Are you arming the system, using devices or tripping motion detectors? Manufacturing standards mean backup batteries are intended to last from four to eight hours at the very least. On average, security systems usually guarantee 24-hour battery backup although it will probably last longer. If you don’t know what your security system’s capabilities are, get a hold of the security company and start asking questions. Knowing the limitations of the system during power outages allows you to put some auxiliary measures in place. So what can be done in the event of a power outage lasting several days? What options have you got to extend your level of protection? Should you suspect that you will experience a power outage, you can bring in extra batteries to support your system. Or you can arrange to get one or more high powered batteries. Most security systems use standard 12 volt DC sealed lead acid batteries, a standard car battery but a lot smaller. You could essentially use the battery from your car (if it is a sealed unit) to back up your alarm system in an emergency. So if you have reason to believe that there’s going to be a power outage, prepare to change the batteries ahead of time. If you know it’s going to be a prolonged power outage, bring in a high powered battery or some standard batteries and make sure they are the sealed type. 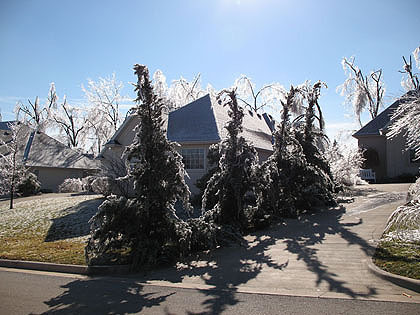 Are you living in an area prone to wintry hazards and extreme weather? For added security why not consider setting up alternative energy outdoor lights. These will add lighting to your home exterior even during a power outage and can prevent a burglar from pouncing. Like conventionally wired outdoor lights, alternative energy outdoor lighting is available in a variety of options, even motion-sensor lighting. These lights will give a burglar the impression that you have alternative power. In the total darkness of a power outage, criminals have plenty of cover to target your normally impenetrable home. But as shown here, there are safety measures that can be taken to ensure that security is constant, even during a power outage.